Suitable for families who have experience hiking/tramping for several hours (see below). This walk is not for all families. A good level of fitness is required and planning needs to happen. 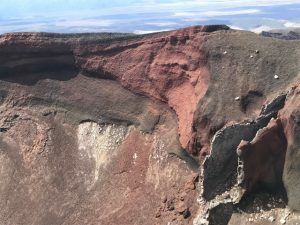 First off, this is a 19.4km walk that reaches 1,886m at the Red Crater summit so checking the weather forecast is a must and you will need to postpone your plans if the weather isn’t looking favourable. Both adults and kids should be good walkers, be used to walking for several hours on New Zealand tracks and possibly even having undertaken an overnight tramp before. The advertising for this walk always suggests that it takes about 6-8 hours of solid walking. This is obviously very dependent on walking speed, it is possible to do it in less but if anyone in your party is stopping every few metres or walking at snails pace, then it’ll take a lot longer! When you check the weather, obviously a non-rain day is best but also look for wind speed and chill factor, as much of the walk is very exposed and windy at the best of times. Not only do all walkers need good shoes (closed toe and good grips, not necessarily walking boots but also not jandals or worn out running shoes), but a hat, sunblock and plenty of layers including a windproof raincoat. A spare pair of socks can be useful after the ascent through ash/gravel down from the red crater as sweaty socks can become uncomfortable. You’ll also need all food and water for everyone in your walking party, not just lunch and treats but also high energy snacks like fruit, nuts, cereal bars etc. Take more food and water than you think you’ll need so you don’t run out. There’s nowhere to fill water bottles en route. The advertised season for this walk is October to April but in reality, November to March would have less likelihood of walking in snow. The walk starts at the Mangatepopo carpark and ends at the Ketetahi carpark – it’s oneway and you’ll need to organise transport to the start /end. Parking restrictions apply at both ends to encourage walkers to use the paid shuttle buses from private carparks off SH46/47. Start as early as you can e.g. 6.30-7.30am partly to give your family plenty of time to complete the walk but also to avoid some of the crowds – in the peak of summer, there can be as many as 3,000 doing this walk on any given day! The queues for the toilets along the track can be very long, make sure that everyone has been to the toilet before you leave your accommodation and see if you can wait before going again till the third lot of toilets where there are 3 or 4 on offer and generally shorter queues. You can extend the walk e.g. by going to Soda Springs – don’t take these options as the walk is long enough without the extra tracks! As it’s a oneway walk, you’ll need a ‘decision point’ at which you decide as a family if you’re going to continue or turnaround and go back to the beginning. A good place for this decision is after a good portion of the uphill when you come out at the base of Mount Ngauruhoe. After this it really is a case of ‘no return’. 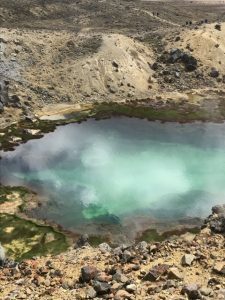 The first half of the walk is breath taking – lots of varied landscape and plenty to see in the form of the volcanoes and then up to the Red Crater and sulphur lakes. For the last 9km or so, the walk winds down through alpine tussock and is challenging simply because it gets tedious. Kids especially will be tired and the main ‘sights’ have already been seen. You’ll need to have something up your sleeve to help struggling kids with this section, whether it’s a topic of conversation, silly games to play, an edible treat or the ability to take anything that your youngest walkers are carrying to lighten their load. Only you know your children and know what they’re capable of. The benefits of doing such a walk are endless – the satisfaction you can all feel when it’s completed, the visible geography lesson at every turn and the amazing memories created. But it’s not for everyone and please make sure you do your homework before deciding if it’s for you and your family! Address: start at Mangatepopo carpark, 6km from SH47. Arrange a lift or transfer by shuttle bus (see website for operators). The walk ends at Ketetahi carpark, about 1km from SH46. Again you’ll need to either have left your car on SH46, arrange for a lift or use a shuttle bus. Car park restrictions apply October – April at both ends of the walk. Best time to walk: Ideally look to walk between November – March starting early in the day but having checked the weather forecast.